Christopher Cook is a Delivery Driver for Arps Dairy and is therefore responsible for providing a high level of customer service while delivering Arps Dairy products to customers along his route. 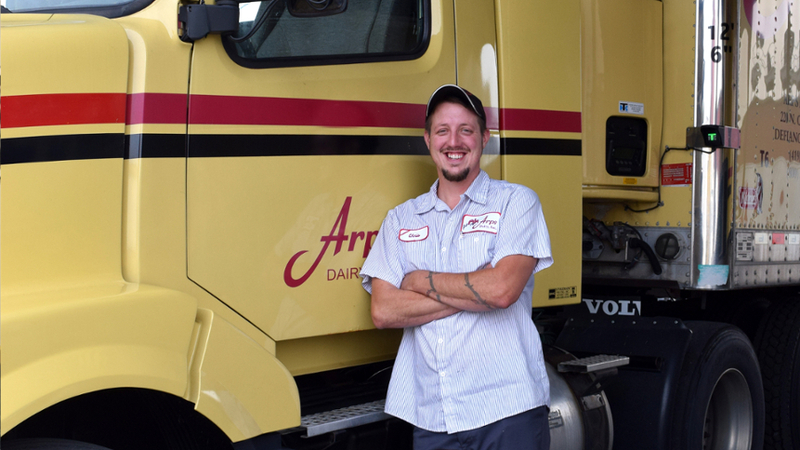 Arps Dairy prides itself on service, and that is in large due to our wonderful drivers like Chris who always go the extra mile to ensure Arps customers are well cared for and are always satisfied. When asked, “How did you learn about Arps,” Chris stated that “I grew up with Arps Dairy in my fridge. I have always loved Arps products, and for good reason. When I think of Arps, I think of quality, great taste and a local freshness you just can’t find anywhere else”. Chris has always had an interest in local delivery jobs, and given that he’s always had an interest in Arps since he was a kid, he felt this position to be a great fit. Chris does admit; however, that driving in harsh weather does pose a challenge. “Customers need dairy products no matter the weather, and I strive to fulfill those needs in a safe and timely manner”. Chris would like the community to know that, “Arps is true to quality and freshness. There is a lot of hard work behind the scenes here at Arps that goes into making our dairy products. It’s simply dedication to excellence from every employee”. When Chris isn’t driving an Arps Dairy delivery truck, he can usually be found doing some sort of repair on a vehicle somewhere. His automotive repair skills certainly do come in handy while driving a truck. As part of National Dairy Month, Chris will be given a Dairy Care Package which he intends to give to a family member who he sincerely admires.